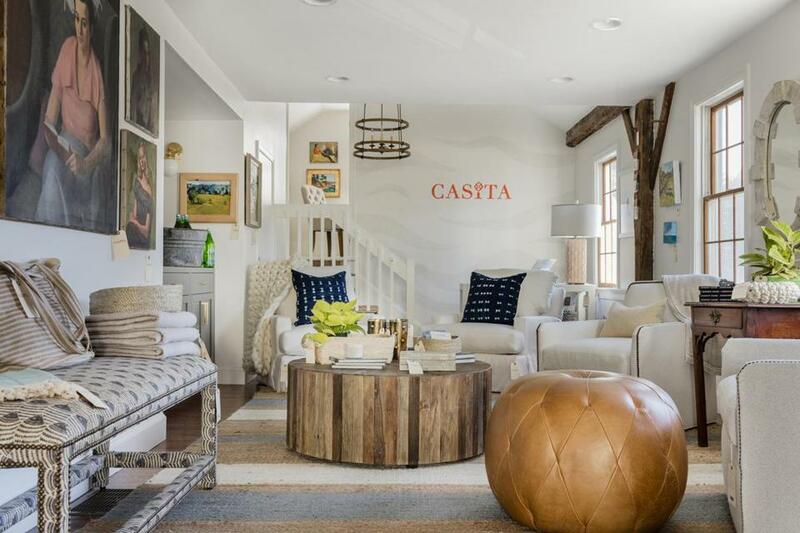 Casita opened in September on Boston Post Road in Sudbury. For the past couple of years, the husband and wife team of architect Kevin ten Brinke and interior designer Kalah Talancy have run their business, KTII Design Group, out of their Sudbury home. Until the business outgrew the space, that is. Without a doubt, they needed a real office for their design firm. But they had grander plans in mind. Talancy, who worked on the display team for Anthropologie for years, wanted to launch a retail home furnishings shop, too. And so, Casita was born. Located in an old post and beam structure on Boston Post Road in Sudbury, the artful trove opened in September. Ten Brinke and Talancy had eyed the spot for years. Both Sudbury natives, they wanted a shop with a prominent window where they could create eye-catching displays. Ten Brinke’s office is on the top floor. Talancy’s studio is a few steps up from the retail space on the main level. The shop is part furniture showroom: Lee Industries upholstered furniture is showcased along with reclaimed farmhouse tables crafted by Watertown-based Salt Woods. “People are able to get a sense of quality and the way things fit,” she said. Casita also offers lighting, including chandeliers and pendants by Currey & Company. There is also a selection of gifts — from picture frames to artisanal soaps to hand-woven baskets and thick wool throws. There are antiques, too. “We pay close attention to where things are sourced. We’re trying to support small businesses that are doing something unique,” Talancy said. Casita, 357 Boston Post Road, Sudbury, www.kt2designgroup.com/shop/. Open Tuesday-Saturday 10 a.m.-5 p.m.